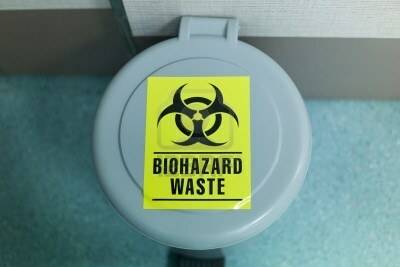 Hazardous Waste - Which Autoclave is Best for Sterilizing Waste? If you haven’t been using an autoclave to sterilize hazardous waste, it’s not too late to start. So, which autoclave is best for sterilizing waste? Pressurized steam at 270 degrees Fahrenheit and 30 psi inside a steam autoclave is sufficient for most hazardous materials and contaminants. Because you are dealing with hazardous waste, it’s imperative to know that the autoclave has thoroughly sterilized the contents. It’s good practice to test your autoclave monthly to make sure it’s working properly. Learn more in our article How Do I Know My Sterilizer Works? Autoclaves generate extreme heat, so it’s important to take proper precautions when using autoclaves to sterilize hazardous waste. Many sterilization manufacturers install safety interlocks that prevent the autoclave from running if the door isn’t securely closed, but not all of them have this important safety feature. Find out if your autoclave has interlocks and be extra careful if you find out that your autoclave doesn’t have them. Never touch the chamber walls inside the autoclave and always use gloves when removing items. Radioactive material or any material that might be contaminated by radiation. Combustible, flammable, or volatile liquids. Any liquid in a sealed container. Any that has to touch the interior surfaces of the autoclave. Waste must be packaged so that the steam can penetrate the load. The density of the load affects steam penetration. Do not overload the autoclave bag or compact it too tightly. Additionally, the autoclave must be loaded properly to ensure sterilization. You can add water to the waste that will generate additional steam for sterilization. Do not overload the chamber with autoclave bags. After removing waste from the autoclave, make sure the bag clearly shows the word “autoclaved” on the outside. This indicates to inspectors and workers at waste handling facilities that the bags they are handling have been sterilized. Place the autoclaved bag inside a large trash bag and dispose of it as you would with normal garbage. Using this method of sterilizing waste will save you a lot of money, because you will no longer have to use hazardous waste disposable. For more information about disposing of hazardous waste, see the EPA website. If you’re not sure how to choose a sterilizer to dispose of your hazardous waste, give us a call. We sell all kinds of sterilizers and autoclaves, including steam sterilizers, dental sterilizers, gas sterilizers, and dry heat sterilizers. We’re you’re sterilizer equipment experts. Call us today at 877-789-9983 for free information and support.